1. 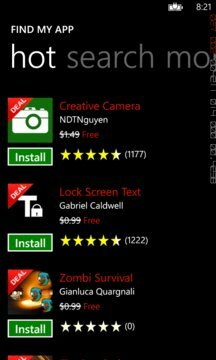 Find app deals and hot new apps on Windows Phone. 2. Browse top apps in iOS and Android and find matching apps on Windows Phone. 3. Search apps from Windows Phone, iOS, and Android. 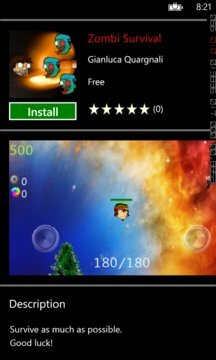 Find My App provides app deals and hot new apps on Windows Phone. Our data is refreshed every day, so it is always up-to-date. Find My App also allows you to search apps written for iOS (iPhone/iPad/iPod) or Android. For an app on other platforms, we will either find you the exact matched app on Windows Phone or similar apps. Whenever you see a cool app on iOS or Android, you can search it on Find My App. Find My App will find you the match if there is one.